Food+Tech Connect and GRACE Communications Foundation present Hacking Meat, an online conversation exploring how information and technology can be used to hack (or reimagine) a more sustainable, profitable and healthy future for meat. 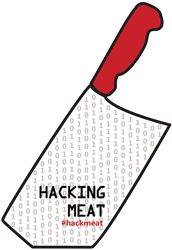 Join the conversation and share your ideas or product requests in the comments, on Twitter using #hackmeat, Facebook or Tumblr. Ryan Farr (Right) and Kent Schoberle (Left) of 4505 Meats at their Hack//Meat SV butchery demo. For likely the first time in Silicon Valley hackathon history, Hack//Meat SV (June 21-23 at The Stanford d.school) brought together the culinary and digital meanings of the word “Hack.” Ryan Far, the chef, butcher, and “master stomach” behind San Fransicso’s 4505 Meats and his colleague, Kent Schoberle, fabricated a fourth of a grassfed cow donated by Estancia Beef while enthralled hackers asked questions throughout the hour-long process. Hackers, including food industry leaders, entrepreneurs, technologists and creatives, who had convened to prototype solutions to some of the greatest challenges facing sustainable meat, got a first-hand lesson in whole animal butchery from a pioneer of the nose-to-tail movement. Farr found whole-animal butchery after spending years in the restaurant industry. His continued frustration with animal sourcing and waste issues inspired him to take the bull by the horns and tackle whole animals from sourcing to serving. Through a DIY approach, he began to craft his own unique handling of the butchery process, with entire animal consumption as his guiding mantra. 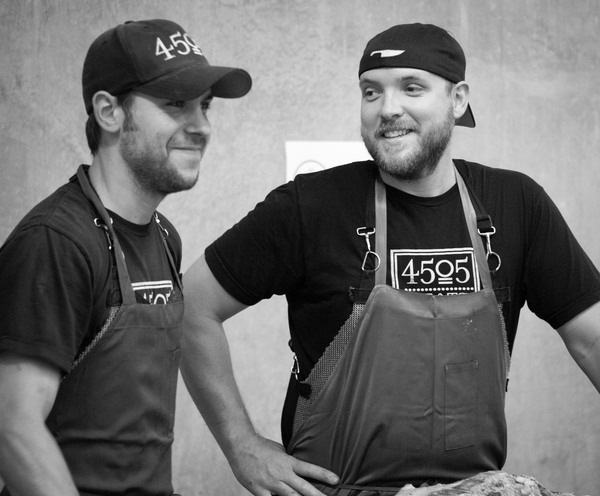 Now 4505 Meats has expanded into a mini empire; they operate and sustain disperate components including the brick and mortar shop in San Fransisco, farmer’s market stands, custom CSA’s, sausage production, catering, and butchery classes. Farr believes that technology will transform the sustainable meat industry. I had the opportunity to speak with him about the role tech currently plays in his operations and his thoughts on the expansion of that intersection in the future. NM: How can information and technology be used to hack the future of meat? RF: Quite simply, tech is the future. It will make it so much easier for the world to get information and products. Tech has the potential to make everything easier and take the complexities out of the meat supply chain. Now is the time for the meat world to catch up to the rest of the world in terms of technology. NM: What role does tech play in your daily business? RF: We use math and percentages for everything, especially to help with consistency in value added products. If we are dealing with the whole animal, I know what cuts of meat we will get from each animal dependent on its original weight. We put that information into our database and write a recipe for it. This allows us to plan accordingly in terms of sandwiches, steaks, burgers etc. We use tech on a day-to-day basis to achieve consistency across the board. We get a clear picture of how much of retail and non-retail cuts we have, and then we create recipes based on what weights we have to work with. This way we eliminate as much waste as possible. On the consumer side, we manually put information about the cuts in our database, so that if we are processing lambs next week we know exactly what we have available for our customers. NM: What are some challenges you face with integrating technology? RF: Finding the time and money is the challenge for us right now. If I felt that we could increase business by selling individual cuts online then we would. Right now we are focused on selling more at the butcher shop and at the farmers markets. NM: What are your dream technology solutions for the sustainable meat industry? RF: I wish we had a step-by-step program that I access from my phone or table that would synthezie all information regarding animal fabrication and usage. For example, if we were receiving three cows, we could type that in and we would be prompted with a series of questions like 1) what do you want to do?, then 2) what percentage is for sandwiches/retail?, then 3) what cuts? and so on. This type of program would also generate recipes based on the cuts and quantities along with labor requirements. All of the available cuts would automatically be available online so that customers could purchase through our site directly. Right now we focus on selling at farmers markets and our butcher shop, like I said, but if we had a program like this we would be able to effectively scale our online business. How can information and technology be used to hack the future of sustainable meat butchery? Share your thoughts in the comments below, on Twitter using #hackmeat,on Facebook or Tumblr.